På äventyr med två småttingar?! I em ska jag rulla ut med stora syskonvagnen (vi kallar den "traktorn") och mina två småttingar på 1,5 år (Anthea) och tre veckor (Leo) för första gången - helt själv! Det bär förmodligen av till närmaste parklek så Anthea får utlopp för sitt ouppdämda lekbehov. Tanken var ju egentligen att hon skulle gå på dagis vid det här laget, och leka med alla dagiskompisar några timmar om dagen. Men hon har inte fått plats förrän i slutet av augusti, så tills dess är vi hennes lekkompisar på heltid. Det är ju supermysigt vara med Anthea och upptäcka världen tillsammans med henne, däremot gäller min oro amningen. Bebisen ligger visserligen och sover för det mesta men ammas måste han ju och då kan jag ju inte direkt störta iväg och rädda stortjejjen om hon skulle hamna i trubbel. Ska jag remma fast henne i vagnen medan jag ammar? Our hood shaken by an earthquake! 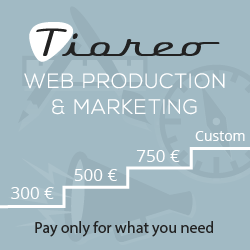 Probably most people prefer blog entries introduced by tempting headlines before those with simply plain text. Still I've been resisting to use them as I've considered them superfluous, even glaring. Don't know why. However, through my daily blog reads I've learned to like them and understod that I need to have them too in order to make my blog more interesting. Though making them catchy doesn't seem to be easy. 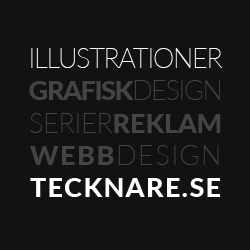 Another change I'm thinkting of is writing in Swedish instead of in English. It's fun with changes! Back to the headline of this entry. Yes, it's true that an earthquake shook our neighbourhood. It was on Thursday early early in the morning that there was an earthquake, of size 2 on the Richter scale, with its epicenter about 500 meters from our home. The earthquake could be felt on a 5 km distance though either my husband or I felt it as we had just fallen a sleep very deeply. One good thing about living in Sweden is the rare occurence of nature cathastrophies so earthquakes aren't usual here, especielly not in the Stockholm area. I've now knitted the same object twise for the first time ever - it's another Flower Basket Shawl!! 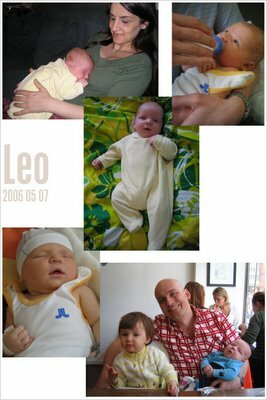 I blocked and finished it as we where back with our little Leo from the "horror-delivery", see more in below entry. I now understand why my body was acheing so much the last months of the pregnancyand why I started to feel really uncomfortable at the end. I was actually carrying around two more 1-litre milk packages than during my last pregnancy, Anthea only weighed about 3 kg. 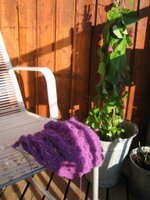 The FBS projects became my salvation and gave such alleviation - knitting them was my therapy, my meditation!! Next up're old abandoned projects. First I'll be picking up an old Trellis cardigan project that I was busy with last August. After a complicated delivery our five kg baby boy was born on the 7th of May at Karolinska Sjukhus in Solna!! 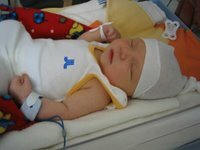 At first his condition seemed so serious he was taken into the intensive neonatal division, which is among the top best neonatal divisions in the whole world! Here he had to stay for two days while he was thoroughly examined. Their safety margins are really high so we could be really safe they wouldn't miss anything serious. The examinations indicated that his condition wasn't so serious after all and the following three days he was under surveillance at the family neonatal division where me and my husband where offered to stay together with him in a really fancy modern two bed room. We where then sent home but will be giving him some medicin for a few weeks before the finishing check-up. The doctors're really satisfied with his condition and the nurses talks about a "sunshine story"! However, we are so glad to be home with our "little" lionlike boy. He's red haired, has really strong arms and an impressive chest and at the same time the calmest and softest face. We're seriously thinking of naming him Leo! 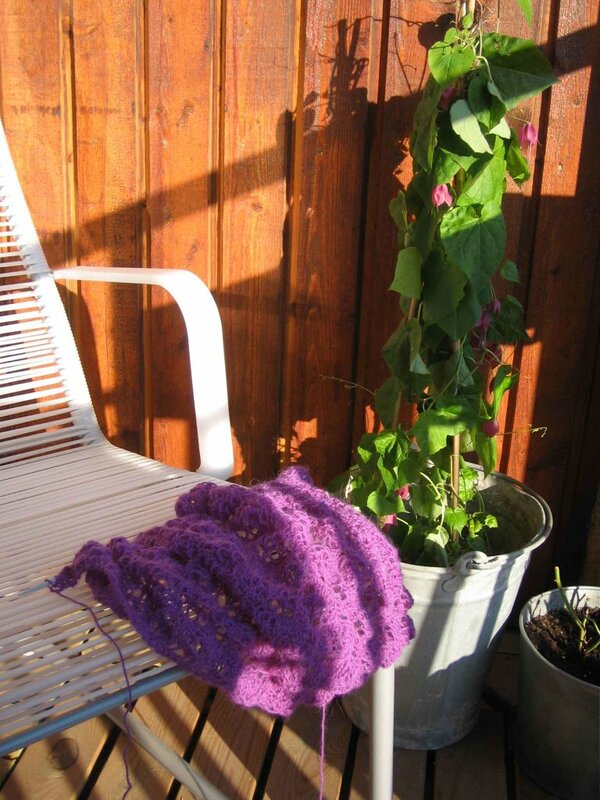 In order to take on and complete a knitting project successfully I've learned to know that I need the knitting project to be a bit of a good challenge to me, something that gives a learning experience. Not that the pattern should containg anything indistinct but if I get too boored i tend to leave the knitting project for "tomorrow". I sense I've learned to know the pattern of my current knitting project too well. I don't make anymore mistakes but just knit mechanically. 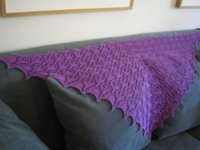 There's nothing new about knitting a Flower Basket Shawl anymore. However, as I've managed to reach to repeat number seven (out of the nine I intend to make) I'll most likely finish this time! Especially since I need this project so badly in order to distract myself from the looong waiting on my son-to-come, I'm twelve days overtime today! But I'm afraid that this will be the last Flower Basket Shawl in a very long time and still I'd like to have one more in a beige type of colour, as on the picture of the pattern.